Epic road trips needn’t roll on an epic set of wheels. What they do require is something impressive – and hopefully stimulating – to gaze at. A feast for the eyes as you click off the kilometres either rapt in good conversation or listening to a playlist of hand-picked driving tunes. Sadly, the wintry route along highways 401 and 416 from Toronto to Ottawa is without such rewards. Which is why I lean heavily on my ride to find pleasure in an otherwise bleak trek. Why, you may ask, didn’t I choose the more scenic and serene Highway 7? It’s because of the slow pokes gawking at said scenery. Not to mention those drivers sitting bolt upright in their bumper-stickered minivans, eyeing the speedometer to ensure it remains just shy of the posted limit – saving us all (and the polar bears) from mass extinction. So in the interests of speed and sanity, I chose the lesser of evils to visit my brother in the nation’s capital. Which this time involved the Infiniti QX50, my tester for the week. At time of writing, roughly 72 percent of Infiniti sales were SUVs, spread across five models from the compact QX30 to the battleship-sized QX80. The QX50 ranks second in total sales, behind the three-row QX60. It is also roughly a foot shorter, and although the QX50 lacks seven-passenger seating, is more car-like and maneuverable. Which is a plus in today’s tight parking spots that fail to recognize just how many of us have switched from cars to crossovers and SUVs. The QX50 is all new for 2019, presenting a bolder face and more aggressive look than its predecessor. The sheet metal is less curvy, but at the same time more aerodynamically slick. Hood, bumpers, tailgate and underbody are all designed to improve airflow. It is also built on an all-new platform, using a more moldable (and weight saving) high-tensile steel that can be easily shaped, while being 23 percent more rigid. The dual-display setup, flanked by large buttons, takes care of most vehicle functions and presents an uncluttered centre stack. All of which is interesting, but buyers in this segment are looking for more than clever engineering. Style, craftsmanship and brand cachet are also high on the check list, otherwise one might opt for a similarly-sized Nissan Murano that starts at $31,498. The base QX50 will set you back $44,490, but for the extra $13K, you get more than just a swanky badge. Content includes intelligent AWD, 19-inch alloys, power moonroof, heated power side mirrors with integrated turn signals, heated front seats with power adjust for driver and passenger, heated steering wheel, dual-zone climate control, and rearview monitor. Standard six-speaker audio is managed through Infiniti’s InTouch dual monitors – upper 8-inch and lower 7-inch touch screens that display infotainment, climate and other vehicle settings. And on the safety front, the base QX50 gets blind spot warning, pedestrian forward emergency braking, and predictive forward collision warning. 60/40 split-fold second row seats fold flat to expand the cargo area to 1,822 litres. 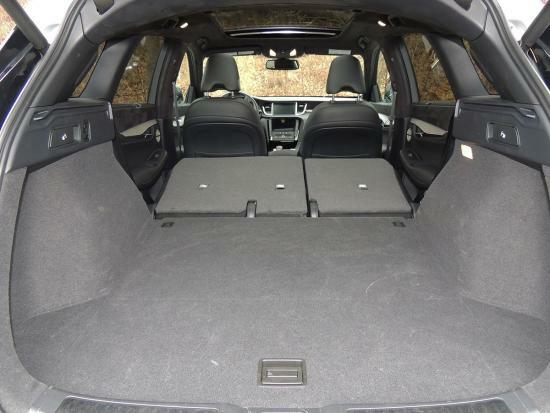 Rear seats offer plenty of leg room, and are not only reclinable, but feature manual fore/aft sliding that expands the cargo area from 895 to 1048 litres. Or fold them flat to max the cargo hold to its full 1,822 litres. But the entry unit doesn’t include ProPilot Assist, the company’s semi-autonomous drive tech that’s finding its way into ever more Nissan and Infiniti vehicles. If you want it, you’ll have to go mid-lineup. My tester, the $56,490 Sensory model, was fourth of five trim levels and included plenty of luxo features like larger 20-inch dark-tinted alloys, tri-zone climate, power tilt/telescopic steering, premium leather upholstery with front seat cooling and driver memory, heads-up display, motion-activated liftgate, upgraded 16-speaker Bose audio, and more. All that, and the full safety suite: backup collision intervention, distance control assist, intelligent cruise control, steering assist, blind spot intervention and lane departure intervention. Several of these form the alchemy that is ProPilot Assist. This feature became my go-to during some of the dreariest highway stretches, holding a steady pace, keeping me between the lines, and maintaining a safe distance from the vehicle in front. “Semi” autonomous means you still need hands lightly on the wheel. Take them off and you get a stern warning message, or worse yet, several demerit points and hefty fine. That aside, letting ProPilot handle the micro adjustments in steering and braking over the long haul leaves you feeling less tired and cranky by the end of the trip. 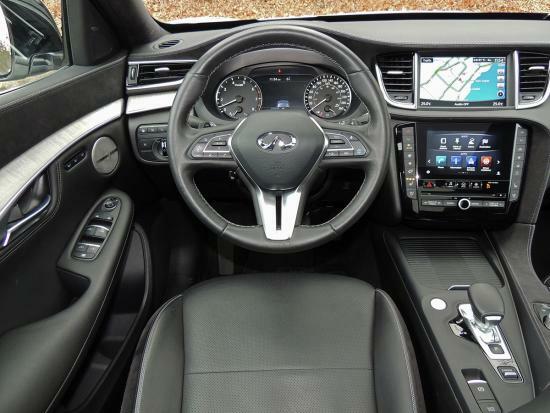 No small part of the driving experience is Infiniti’s first-class cabin, that in my vehicle included a mix of leather and Ultrasuede wrapping doors, dash, and centre console. These skins and faux-skins are held together with high-contrast double stitching. 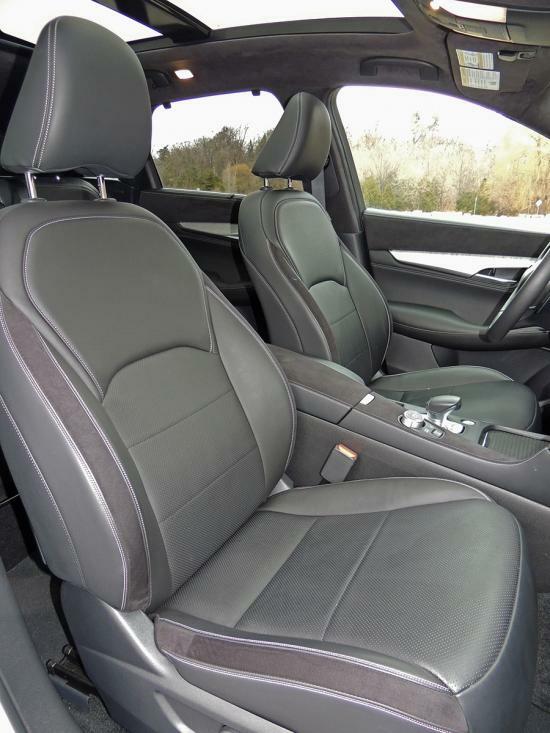 QX50’s power adjustable, heated front seats in this Sensory model are clad in leather and offer long haul comfort. Materials, overall, are high-quality and well fitted, and the dual-screen centre stack, flanked by large buttons, helps keep the cockpit relatively uncluttered. Ride is soft and car-like, with a touch of body roll in hard turns. No big deal, as it would be silly to expect razor-sharp cornering in this kind of vehicle. Those considering a Jeep Grand Cherokee SRT (or Trackhawk) aren’t shopping Infiniti anyway. That being said, the QX50 is no slouch in performance. The previous model was powered by a quiet yet gutsy 3.7-litre V6, rated at 325 hp and 267 lb/ft of torque. I’m familiar with the ubiquitous VQ engine, and have had nothing but praise. Hence, I questioned Infiniti’s enthusiasm for swapping a perfectly fine six for a turbo four. But not just any turbo four. This one uses a multi-link to raise or lower the reach of each piston to increase or decrease compression. High ratios for efficiency; lower ratios to up power and torque. These range from 8:1 to 14:1, and at 10.0/7.8/9.0 litres/100km, the VC-Turbo delivers significantly better fuel economy than its predecessor. Power numbers are pretty good too at 268 hp, and more importantly, 280 lb/ft of torque coming in at an early 1,600 rpm. The last-gen V6 peaked at 5,200 revs. Where the former powertrain included a seven speed automatic, the VC-Turbo is mated to a continuously-variable transmission (CVT). But don’t let that put you off, as it has manual shift mode and downshift rev matching, and like other Nissan/Infiniti products, this CVT feels more like an automatic. And when you put it in Sport mode, it fires off gear changes lickety-split. All of which takes the QX50 from zero-60 mph in only 6.3 seconds. Mind you, keeping it in Sport and applying a heavy foot won’t net the thrifty fuel numbers. I kept it in “Standard” mode most of the time and averaged 10.4 litres/100km. Not bad for winter driving. “Eco” is more frugal, strips the powertrain of its liveliness. I’d rather pay a few more pennies at the pump. Bottom line, road tripping in the QX50 was something I hope to repeat on a different route, and in warmer temps. But six months of crappy weather is what we Canadians have signed up for, and SUVs like the QX50 help make it more bearable – whether you’re driving cross country, or suffering through your weekly commute. 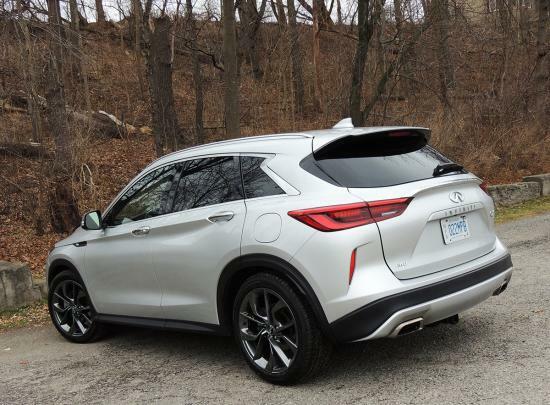 Infiniti’s signature crescent-shaped D-pillar, integrated roof spoiler and wide shoulders give the QX50 a sporty look from the rear. PRICING: Luxe $44,490, Essential $48,990, ProACTIVE $52,990, Sensory $56,490, Autograph $57,990. For pricing on additional packages and options visit website. Freight and taxes extra. The XC40 begins with all the right stuff. Cargo space behind the rear seats, although not cavernous, was enough to pile in four suitcases, a cooler bag, and a few odds and ends, without having to ditch the privacy cover.